In urban areas, condo developments are an exploding market. New projects pop up practically every day, and properties move on and off the market at a blindingly fast pace. Keeping up with the latest in condo real estate can be a daunting task, but with the right news source, you can stay on top of it all. These 20 blogs feature the best in up to date news and features on local condo real estate, sharing new condos for sale, neighborhood profiles, advice, and more. 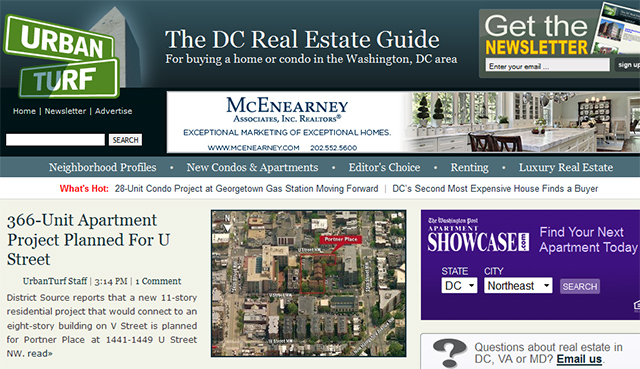 On Urban Turf, you’ll find real estate news for homes and condos in the Washington, D.C. area. The blog shares hot new condo projects, neighborhood profiles, and new available condo listings in DC. Explore Seattle condos, lofts, and apartments on Urbnlivn. Featuring the newest and most attractive Seattle condos for sale, this blog is a great resource for Seattle condo real estate. Stay up to date on Boston condo real estate with this blog. You’ll find out about condo investments, inventory, even notorious Boston landlords on the Bates Real Estate Report. Find market trends, professionals, and advice on the CondoBlog. You can view national condo news, or go local in Miami or New York City. Study Brooklyn condo real estate with the Brownstoner blog. This resource shares Brooklyn real estate news, market trends, and neighborhood updates. You can even search for your own brownstone condo in Brooklyn. See downtown Austin condos and more on the Downtown Austin blog. You can study neighborhoods, see new property listings, transportation news, and solutions for urban Austinites. Follow the news on condo vultures, sales, preconstruction, and more in New York City and Miami with The Real Deal’s condo news. Study San Francisco hot spots, properties, agents, and more on Climb Real Estate’s blog. You’ll also find advice, like choosing the right time to sell, market predictions, and local resources. Check out Wicked Local Boston Homes for the latest in prime Boston condo real estate. You’ll find featured properties, open houses, and new condos for sale. Focusing on Sarasota condo real estate, this blog has everything buyers and sellers in the area need. The blog shares community and local business spotlights, updates on foreclosures and short sales, and new listings for buyers to check out. Get an inside look at NYC real estate on Brick Underground. One of the best features on this blog is the Price Check, posts that show you what a certain budget can get you in different New York City neighborhoods. The blog also shares renovation resources, buildings, and rent coaching. Encore Realty’s Boston apartment blog is all about apartment and condo real estate in Boston and the city’s surrounding suburbs. Find resources for luxury living, a live condo search, neighborhoods, and more. Visit YoChicago for real estate news and trends in Chicago and its suburbs. The blog has guides, condos for sale, and in-depth condo real estate videos. Compare urban living in Seattle and nearby Bellevue on the Urban Condo Spaces blog. Get alerts for hot condo properties, find out about new sales activity, new development plans, and expansion updates. Cape Cod and Provincetown realtor Jon Goode’s real estate blog has the latest in beachfront condo realty. Visit his blog to learn about condo prices, market trends, and unique real estate opportunities. Real estate insider Candy Evans shares the dirt on Dallas condo real estate. Find the latest townhomes, real estate gossip, and HOA news on her blog. Discover Atlanta’s luxury condo real estate on atlantaSKYrise blog. You’ll find news for new condo developments, the latest sales, and more. Seattle Condos and Lofts features, news, reviews, and spotlights in Seattle’s condo real estate market. Check out the blog to find out what condo owners have to say about their properties, learn about new condos for sale, and even discover condo mortgage news. Discover DC urban lifestyles on the DC Condo Boutique blog. The blog features perks of urban living, including parks, business development, and new services offered to DC urbanites. No condo real estate list would be complete without Curbed. The popular blog features national urban real estate news, as well as local flavored updates in 17 different markets. Discover the most amazing condos for sale, read real estate news, and check out the blog’s house of the day.